Shines range from subtle to striking. Strangely, the subtle ones have been known for centuries, while the striking ones have been known only for decades. The distinction depends upon geometry. Heiligenschein, the subtle phenomenon, depends upon the Sun as a source of light and is seen best in the early morning when one’s shadow is cast upon (some species of) dew-covered grass. 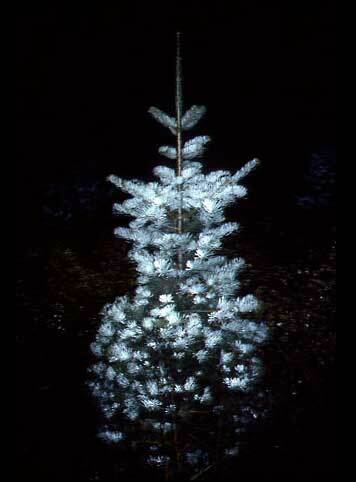 Sylvanshine, the striking phenomenon, depends upon a bright artificial light source and is seen best on a clear, dark night when the light is shone on (a few species of) dew-covered trees. In each case the light undergoes retroreflection, but owing to differences in the light source and the way the dew interacts with the plants, the two shines look quite different. The heiligenschein appears as a bright aura around the head of the observer’s (and only the observer’s) shadow, while the sylvanshine is a bright region spread over the whole tree, but is only seen by the person holding the light. To add to the confusion, there is another mechanism which also produces a bright region around the head of the observer’s shadow which does not depend upon dew and has gained the name, heiligenschein. My fondness for the sylvanshine is evidenced by the fact that its name was chosen for my home. Sylvanshine This small Douglas tree stands out among its neighbours as the only one to exhibit the sylvanshine. Indeed, of the handful of species which exhibit the sylvanshine, most are conifers. 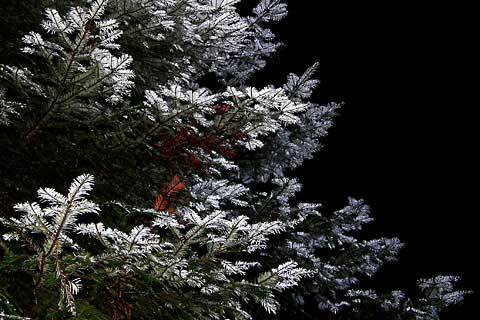 Although giving the appearance of a snow-covered tree in the moonlight, the evening was warm with neither snow nor frost—just the sylvanshine. Heiligenschein The name derives from the apparent apotheosis of the observer; it is German for the light of the holy one. Of course, each person sees the heiligenschein around the shadow of his own head, so the phenomenon does cater to the egotistical: it makes oneself seem more blessed than one’s neighbours. Dry heiligenschein Each object seen in the direction of the antisolar point (the head of your shadow) covers up its own shadow (after all, one is looking along the sunbeam). 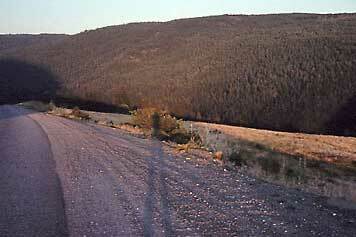 However, if one looks to either side, shadows are seen. 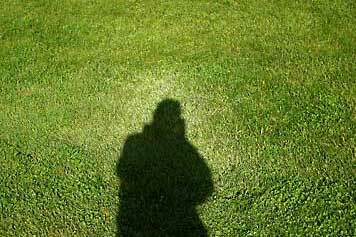 If the Sun is low so the shadows are long, there a noticeable contrast between brightness around the head of your shadow and the darker regions farther out. This bright spot has various names: foresters who see it from a plane have dubbed it the hot spot in the forest; more generally it has the same name as the similar–looking phenomenon caused by dew, but with a qualifier: it is the dry heiligenschein. Species variation A look at some of these pictures might lead one to suspect that a flash camera pointed at any dew–covered tree would show the sylvanshine—it would not. Only a handful of species produce it and most of these are conifers. But, not even all conifers will show the sylvanshine. 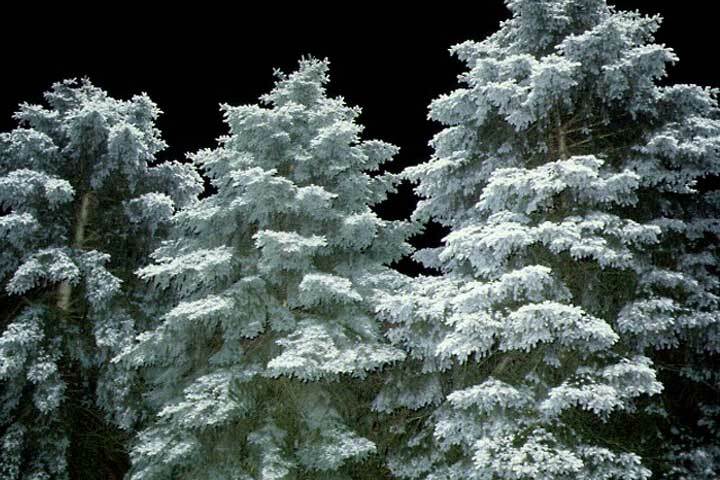 Here are two trees, equally dew covered; the spruce shows the sylvanshine, the pine does not. Lakeside fir Dew bedecks a fir (but which variety?) as the early light of dawn illuminates the Lake. The sylvanshine is revealed by the flash on the camera. Grand Fir The Grand Fir and Kootenay Lake go hand in glove. 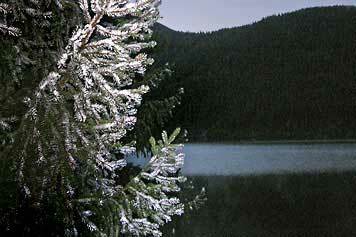 Indeed, there are only two places in Canada where the Grand Fir is native, both in B.C. : around Georgia Strait, and around Kootenay Lake. And that the Grand Fir could exhibit the sylvanshine, I did not know until the night I took this picture. The flash illuminated this midnight scene. 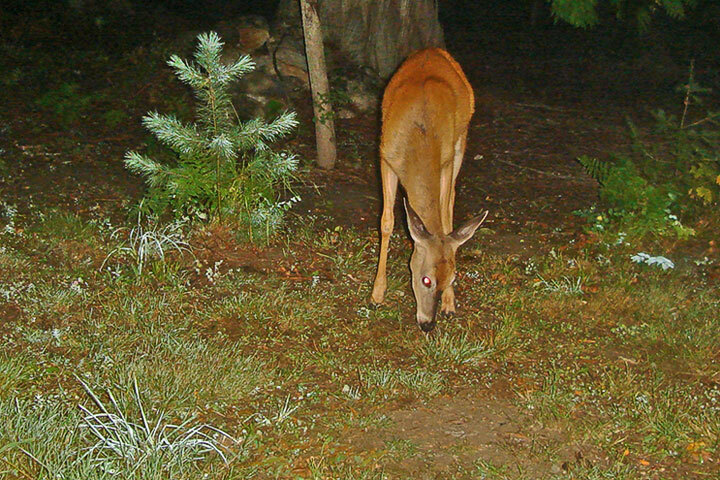 The eyes of the white-tailed deer are retroreflective while the pine needles and some grass blades show the sylvanshine. Sylvanshine in splendor (This is not snow in the moonlight; it is the sylvanshine). For dew to make the tree retroreflective, it must form beads. Most leaves are wetable: the dew spreads out as a flat dome (a small contact angle). Such dewdrops will not produce the sylvanshine. The leaves must be relatively unwettable (a contact angle of say, a 100° or more). The resulting beads of water first focus the light onto the leaf (it is sufficient if the caustic falls on the leaf) and then serve as a light-house lens to send the bright spot back towards the original light (and is thus retroreflective). The ability to form the requisite beads of dew depends upon the nature of the leaf’s epicuticular wax. The grasses which produce the heiligenschein are not waxy, but hairy (vestiture) which enables the dew to bead. Wild grasses tend to have more vestiture than domestic grasses.